Aspen clones were traditionally identified based on similarities in several phenotypic traits including leaf shape. This required several visits of the stands, laborious measurements and subjective visual assessments. In this study, we investigated a novel approach to clone identification using digital morphometrics of leaf shape complemented with bark characteristics and spring phenology. 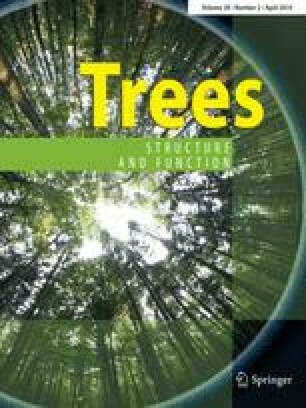 Aspen clones were delineated based on molecular (microsatellite loci), morphological (leaf shape, bark colour and type) and phenological (when first fully expanded leaves appeared) characteristics. Leaves were scanned and images were analyzed using normalized elliptic Fourier descriptors and principal component analysis. Using microsatellite loci, 18 clones were identified among 60 aspen trees in three sites investigated in this study. When employing digital morphometrics, foliar types in two out of the three sites matched the clones defined by microsatellite markers. Many ramets from the third site were clustered erroneously into incorrect clones. The reclassification test indicated that leaf shape contains features according to which very similar clones can be differentiated with low error rates. However, because it was not possible to set a threshold for maximum distances within clones, application of digital morphometrics of complex leaf shape for clone identification in natural aspen stands with a high number of multi-ramet clones and many singletons is unfeasible. We judged spring phenology as the least reliable trait for clone recognition and suggested possible causes of heterogeneous leaf flushing among ramets of the same genotype. We thank to everybody who has participated in this project namely M. Baret, E. Whitfield, and C. Pack. This work was supported by the Centre for Forest Research, National Science and Engineering Research Council, Industrial Chair NSERC-UQAT-UQAM in Sustainable Forest Management, Fonds de recherche sur la nature et les technologies, and the government of Quebec.